Supports the digestive and immune systems. Digestive enzymes are protein complexes that are essential for food digestion. They break down foods into nutrients that can be absorbed and used to build all body systems, including cells, tissues, organs, glands, hormones, etc. There are three main categories of digestive enzymes: proteolytic enzymes that digest protein, amylases for carbohydrate digestion and lipases to break down fat. 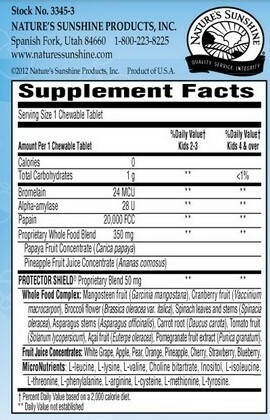 Whole Foods Papayazyme combines pineapple and papaya fruits-whole food sources of digestive enzymes-and is fortified with additional digestive enzymes, including proteolytic amylase for healthy digestion of most food types. 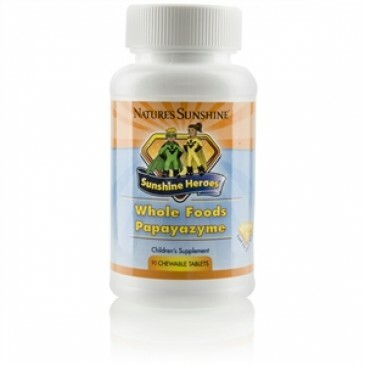 Whole Foods Papayazyme provides digestive enzymes at levels that are safe for chewing and gentle enough for children. Bromelain, alpha-amylase, papain, papaya fruit concentrate, pineapple fruit juice concentrate and the Sunshine Heroes Protector Shield blend.